Perennial plants in the Midwest are well attuned to their surroundings. They hunker down all winter in a dormant state, just waiting for a sign that it's safe to unfurl their first tender leaves or flower buds. For many plants, the cue is a sustained warming trend, but day length also factors into the dormancy equation. Day length is governed by our trip around the sun each year – that's set in stone – but unusual temperature fluctuations are becoming more common as our climate is changing. So what happens to perennials when the sun tells them they should stay dormant, but warming soil tells them another story? A new study from the University of Illinois has some answers. Switchgrass and prairie cordgrass, both native perennial grasses grown for biomass, come out of dormancy when the soil warms up for a week or more, usually in April. As temperatures rise, stored carbohydrates in the plants' rhizomes are converted into mobile forms to fuel growing tissues. If this happens during an unusually early thaw, new shoots could be killed and rhizomes could be left depleted when temperatures return to their normal range. The plant may not have enough oomph to produce new shoots later in spring, affecting biomass yield in agronomic settings or competitive ability in natural plant communities. To look at the interplay between soil temperature, day length, and dormancy in switchgrass and prairie cordgrass, D.K. Lee and his collaborators designed a study to trick the plants. "We dug plants up from the field and brought them into warm greenhouses in Illinois and South Dakota every month from October through March," says Lee, an agronomist in the Department of Crop Sciences at U of I. "The only lighting was the sun, so the plants had to react to the ambient photoperiod, or day length." The warm temperatures triggered plants to start growing, but some of them got confused by the short days after they emerged. "Plants collected from October to January woke up, then, 'whoa!' The days were much shorter than they normally are when they wake up. Especially in October, November, and December, day length keeps decreasing. It's too short. The plants think it's weird," Lee explains. So weird, in fact, that the plants reentered a kind of dormancy. New switchgrass shoots stopped growing, but stayed green and alive; the researchers referred to this as stagnation. But the new shoots that prairie cordgrass produced died back completely. "Cordgrass went back to sleep," Lee says. "The temperature cue for breaking dormancy was overridden by the day length cue." Lee notes that the original intent for the study was to gather information for breeding purposes. "Often times, we are trying to make crosses between two different populations with two different flowering times," he says. "We artificially try to control and synchronize flowering by altering day length. Here, we weren't changing day length, but we still wanted to see what happened with flowering." The plants were allowed to continue their growing cycle through flowering. For the most part, flowering happened when it normally would, as flowering tends to be controlled more by day length than temperature. Regardless of the original intent of the study, Lee keeps coming back to what his results say about potential effects of climate change on perennial plants. "We think of climate change as being a slow and steady process; it's possible that evolution could keep up with a pace like that. But we're seeing extreme and sudden temperature fluctuations. That's what we're worried about," he says. If perennial plants come out of dormancy during an early thaw and then get hit with a late frost, which is what happened in 2012 in Illinois, the crop for that year could be lost. Even though prairie cordgrass is known to be cold tolerant, if short days force it back into dormancy after emergence, it still may have lower yields. Those are just the agronomic concerns. Lee reiterates that temperature fluctuations could have major consequences for perennial plants in natural ecosystems. "What would happen if all the perennials die off or produce less biomass one year because of an early warm spell? Would aggressive annual weeds take over? The perennial plant community might have a shock." The unknowns are why Lee plans to continue studying perennial plant responses to day length and temperature. "We still don't really know what's happening with the carbohydrate reserves as these plants just start to break dormancy. Even before we see shoots coming out, they're metabolizing and mobilizing carbohydrates. That's a big energy consumption process, and we need to learn more to be able to predict how they'll cope with temperature and day length cues," Lee says. 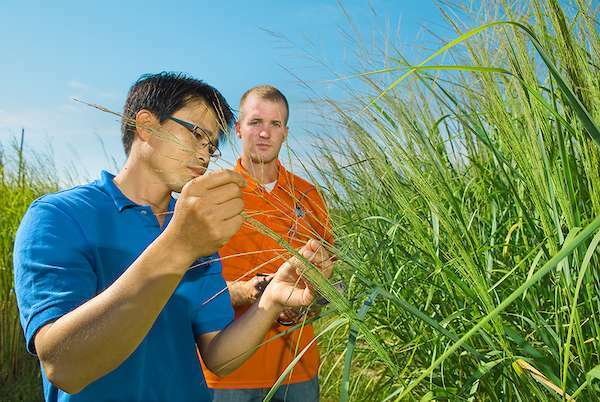 The article, "Growth and development of two perennial grasses in ambient light conditions during their natural dormant period," is published in Crop Science. NASA now must say their planet flattening climate change crisis is as real as they say the planet isn't flat or all CO2 funding will be terminated. Not unless they are also only 99% sure the planet isn't flat. And whoever is preventing climate science from saying "proven" for the worst crisis imaginable, could you please step forward now if it's really about saving planet Earth? We must teach children to love not fear for the planet like cave men. Sorry, cave persons."